It’s been a while since I did a round-up of Chocolate Treats. I’ve had a few sent to me over the last several months and now feels like a good time to let you know about them all. Cornwall is starting to produce some fabulous and innovative chocolate. I’ve already highlighted some of our chocolate producers, but Food of the Gods has only recently come to my attention. Based down at the other end of Cornwall to me, in St Just, this is an exciting new enterprise. Owner and chocolate maker Dal Hall loves his chocolate, but didn’t like eating all the associated sugar and additives that comes with most mass produced bars. Initially running a few raw chocolate workshops for people with mental health problems and seeing the joy it brought them, he decided to start making his own raw chocolate whilst carrying on the day job. Ethics are important and Dal’s chocolate is made using organic and fairly traded ingredients. There are only three things in the base chocolate, cocoa solids, cocoa butter and unusually, date syrup. I was particularly interested in this latter ingredient as it appeals far more to me than agave syrup or Sweet Freedom – the only two sweeteners I’ve so far been aware of. Date syrup is a more natural ingredient, being less highly processed and containing fibre, potassium and antioxidants. The chocolate is 96% cocoa, leaving only 4% to be sweetened by the date syrup. This makes it the healthiest raw chocolate I know as well as the darkest. I was sent three bars to try: one with cocoa nibs, one with mixed nuts and one with rose petals, goji berries and something chocolatey. The something chocolatey is a bit of a mystery as none of the bars had labels on them. However it tasted very nice. In fact both CT and I enjoyed this chocolate very much. Although it’s barely sweet and very rich and dark, it’s surprisingly easy to eat. It’s not at all bitter and you can really taste the chocolate. The texture is also much better than the raw chocolate I’ve made myself; it’s less soft and almost has a bit of a snap to it. It is, however, quite chewy, so better munched than left to gradually melt in the mouth. The nut bar was probably my favourite, even though I was quite taken by the rose which had a subtle flavour with burst of fruitiness from the berries. This Food of the Gods is by far and away the most exciting raw chocolate I’ve yet come across and I wish Dal every success with his venture. The chocolate is available online and at selected outlets in Cornwall, one of which is happily Trevallicks, the farm shop in my home village. Online it costs £2.75 for a 60g bar including P&P. Italian food has to be one of the best in the world, it’s certainly one of my favourites. Finding authentic high quality Italian ingredients isn’t always easy. Vorrei are a new online Italian food shop selling products ethically sourced from small scale Italian suppliers and farms. I noticed many of their products are organic too – bene. I was glad to see they have a particularly pleasing chocolate selection. Giuliette (Colavolpe) – dried oven-baked figs, walnuts, sugar, cocoa butter, Bronte pistachios, powdered milk, lactose and milk proteins, flavouring, soy lecithin, colouring E131. The Colavolpe family have been making figgy confections now for three generations. Based in Calabria, one of their signature ingredients is the dottato fig, a small but tasty variety that grows particularly well in that region. I adore figs and pistachios both, so these little parcels of sumptuousness all wrapped up in white chocolate are just the sort of thing likely to appeal to me. The dried figs are stuffed with a mixture of walnuts, pistachios and white chocolate, then enrobed in more white chocolate. Despite the minimal amount of pistachio in the filling, (only 5%), the flavour was still detectable. I would prefer a higher percentage of pistachio myself and for the food colouring to be omitted. That aside, I enjoyed these so much I really didn’t want to share; poor CT didn’t get much of a look in. The outer chocolate is a good foil for the richer chewy fig within. I found the packaging almost as appealing. Wrapped individually in pistachio coloured foil lined paper, the figs nestled in a similarly coloured box. A box of 12, weighing 250g costs £10.50. Inspired by the names of Betty and Walter bags and accessories, Creighton’s Chocolaterie have created a limited range of chocolate bars to complement them. I was sent one of their bars to try. When the box arrived I didn’t know which of the four flavours I was going to get. All of them sounded interesting, especially the fig and pink pepper dark chocolate. But secretly my heart yearned for rose. I’ve had an affinity with rose ever since I was a nipper and was dressed up as the Fry’s Turkish Delight girl for our village carnival one year. And as I’ve said before, this queen of flowers reminds me of my grandad who was passionate about his roses and won awards for them every year. Beautifully packaged, the chocolate came with a personalised label which immediately endeared Betty and Walter to me and made me smile. Almond and Rose Milk Chocolate – (33.6%) sugar, cocoa butter, while milk powder, cocoa mass, soya lecithin, vanilla, almonds, rose oil. I was so enamoured by the anticipation of not knowing what I was going to get and later by the look, sound and scent of this bar, that I took it in stages. I made the whole seductive process of looking, smelling, touching and finally tasting, last as long as I could. In a nutshell: day one, I received it; day two I unwrapped the outer packaging ; day 3, I unwrapped the inner packaging and tasted the chocolate. Wrapped in greaseproof paper emblazoned with Creighton’s chocolaterie interspersed with yum, I found this to be a classy way of wrapping the chocolate. As soon as the outer layer of plastic was taken off, the evocative scent of rose assailed my nostrils. But what of the chocolate? Thankfully, it tasted delightfully of rose too. The bar was sweet, but whilst I’m not generally a fan of very sweet chocolate, it somehow works with rose. The crunchy pieces of almond gave added texture and interest. Once started, CT got in on the act and the bar didn’t last very long at all. At £3.50 for a 100g bar, this is well worth the money,for the pure anticipatory joy, if nothing else. Seed and Bean is a company I approve of. I’ve reviewed some of their 85g chocolate bars before and here too; the chocolate is both tasty and of good quality. They also come in a range of interesting flavours. But more than that, they are organically certified by the Soil Association and the only UK chocolate company to receive 100% ethical accreditation from The Ethical Company Organisation. This means, in their own words “we give a really fair deal to cocoa farmers, whilst fully respecting the rural environment, both in the UK and overseas”. Cornish Sea Salt – (70% dark chocolate) – cocoa mass, raw cane sugar, cocoa butter, smoked sea salt, soya lecithin, vanilla extract. With my patriotic Cornish hat on, I was very pleased to see that Seed and Bean were using Cornish sea salt in another of their bars. The chocolate is smooth and melts sumptuously in the mouth. It’s not in the least bit bitter, which is generally a sign of good quality dark chocolate. I’m unable to eat more than a square of some sea salted bars I’ve tried as they are just too salty, but here the salt takes a supporting role. There is a subtle note of smokiness that enriches the experience. This is a bar to savour and delight in. Lavender – (72% dark chocolate) – cocoa mass, cane sugar, cocoa butter, vanilla extract, lavender oil soya lecithin, . Lavender is one of those flavours that you either like or dislike. Liking most things herbal, I’m rather partial to it as long as it’s not too overpowering. This one is quite strong, the scent emanates from the bar as soon as it is opened and you can certainly taste the lavender. Both CT and I felt it was a bit too much and thus better suited to baking into a chocolate lavender cake than savouring on its own. Lavender, I’ve found works very nicely in this form as demonstrated by this chocolate lavender cake. Prices for these 85g bars are around £2.30. Scotland’s first chilli farm has a name that immediately appeals to me. It’s no secret, I am a chilli head; next to our garlic, chillies are the most important crop we grow. Chillilicious not only has the distinction of being the most northerly chilli farm in Europe, but it is run by a team of women. Mother and daughter, Patricia and Stacey Galfskiy grow chillies in an environmentally sustainable way and make a variety of products from them. One such is a chocolate bar using the infamous naga – the world’s hottest chilli. Heaven & Hell – (dark chocolate, 53.8% cocoa) cocoa mass, sugar, cocoa butter, soya lecithin, natural vanilla. (white chocolate, 28%) sugar, cocoa butter , whole milll powder, soya lecithin, natural vanilla. Naga chilli. A mix of dark and white chocolate, this bar is topped by dried naga chilli and swirled artfully together, it looks very attractive. The dark chocolate contains the chilli as well as being topped by it. The idea is that the white chocolate soothes the mouth after eating the fiery dark part. Chilli fiend that I am, I was slightly concerned about trying this bar – I had heard stories. Well, it didn’t quite blow my head of, but it nearly did. My throat caught fire almost immediatly after the chocolate hit my mouth. But the sensation of hot chilli together with both dark and sweet white chocolate is quite exciting. Not something I’d want every day, but as an occasional wake up, it’s an experience worth having. Available from the Chillilicious online shop at £4 for a 100g bar. The Food of the Gods chocolate sounds delicious & just up my street. Not so sure about the Heaven & Hell bar even tho I love chilli, you’re braver than me ! Thanks Sarah. Food of the Gods is a good choice. As for the chilli bar, it certainly wakes you up. Some lovely flavours in these chocolate bars, a great review round up. Oh your job is such a toughie, having to try all these fabulous new and intriguing chocolates! 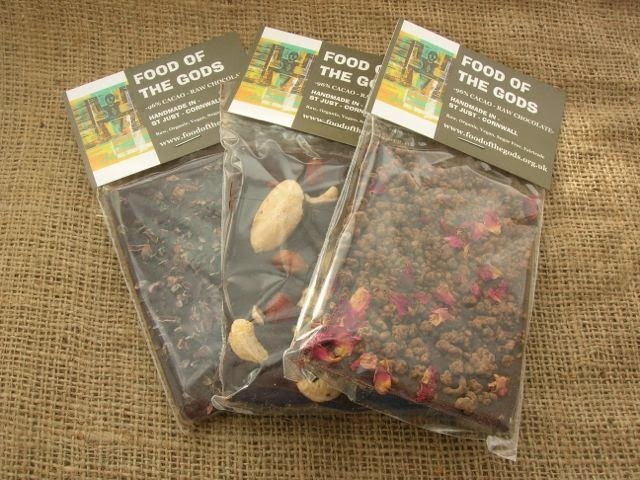 I do love a piece or two of chilli chocolate so the Heaven and Hell sounds very appealing, as does another fave of mine sea salt and chocolate in the Seeds and Beans bars. I know Lou, I have such a hard time. I do really appreciate the chance to try chocolate I may otherwise not even have heard of – especially such interesting ones. Some interesting chocolate there. I love the sound of the Giuliette stuffed figs. They sound amazing! Those figs are just gorgeous Katie. What lovely chocolatey good you got. I would eat them all but I am particularly intrigued by the Giuliette and the Betty and Walter choccies. Sad thing is, I’ve completely run out now Bintu. The Giuliette and B&W were both particularly interesting for being a little exotic. they look good 🙂 never heard of this brand before. Ah that’s my job Sophie to let you all know about the lesser known and usually far more interesting chocolate that is out there. Thanks Sylvia – I’m a sucker for sea salted chocolate too and this one was particularly good. The raw chocolate was pretty good too though. They all sound so intriguing! Thanks Chockette for livening up my breakfast table this morning!